ODOR SOCKS | Pro Chem, Inc. ODOR SOCKS are an industrial-strength deodorizer and uses natural ingredients to eliminate foul odors. 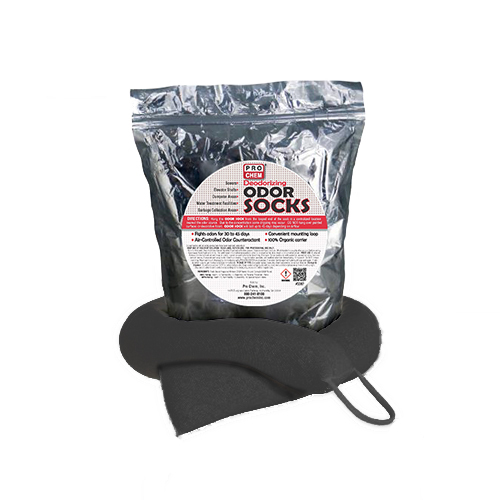 This powerful, effective and concentrated deodorizer comes in a soft, mesh sock that is convenient to hang almost anywhere. ODOR SOCKS are a very effective deodorant that will control odors for up to 45 days depending on airflow. Hang the ODOR SOCK from the looped end of the sock in a centralized location nearest the odor source. Due to the concentration some dripping may occur. DO NOT hang over painted surfaces or decorative floors.